At Junkwize we are able to provide our customers with expert skip hire services in London through our quick quote process and have the ability to rapidly deploy our large number of skips for hire in London. Our skips range in size and are built to accommodate all waste types dependent on the desired size of skip for hire. At Junkwize, we have the ability to cater for small and mini skip hire in London, all the way through to larger skips, ranging in sizes from 4 to 40 yards. In addition to this, we are also able to offer supporting equipment such as lights, locks, waste handling services and skip cradles. Whether you are a commercial business or domestic household, rest assured that environment and eco-friendly waste removal practices are at the forefront of our minds. we always have this in mind with our skip hire in London service. As a prospective customer, we would like to give you the confidence that any waste collected in our hired skips will be dealt with efficiently and responsibly in the most eco-friendly manner possible. Providing skip hire service in London is extremely flexible and easy to do. Skips are able to be placed on private land if there is specific access to the space, and can also be placed on the roads or pavements (however, this must first be confirmed by your Local Authority Permission). Our team always try to go the extra mile for our customers, and more often than not have the ability to arrange a skip permit for you. However, on some occasions, Local Authorities only deal directly with those who are hiring the skip. Local Authorities charge a permit/licence fee and will insist that the skip is covered and has lights on it if is left overnight. Discover more of our waste disposal and removal service in London here. Booking cheap skip hire with Junkwize could not be easier – to do so, please contact us via our website where a member of our team will guide you through the booking process or fill out our booking form to get a quote. If our skips still do not suit your rubbish removal needs, then you’re in luck. 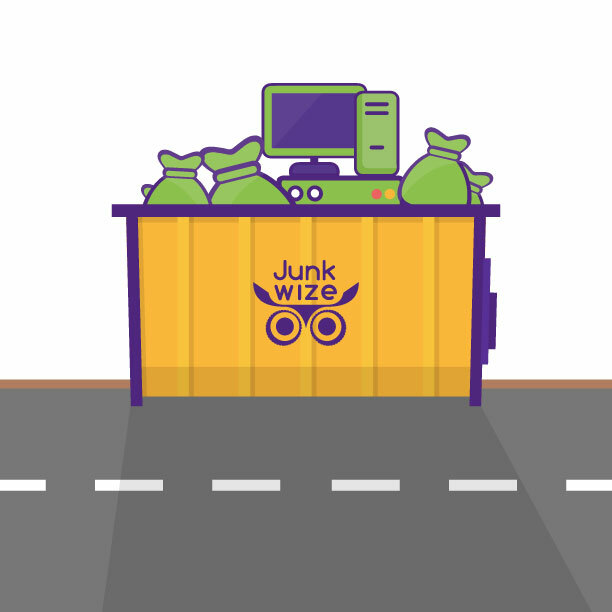 At junwize we offer an extension to our skip hire in the form of our RoRo bin rubbish removal service. Click here to find out more.